open fridge door: Virgin America Ends. When Brand Love Isn't Enough. Virgin America Ends. When Brand Love Isn't Enough. Fly Virgin America as much as you can and revel in an experience that is memorable. Soon you won’t be able to make new ones. 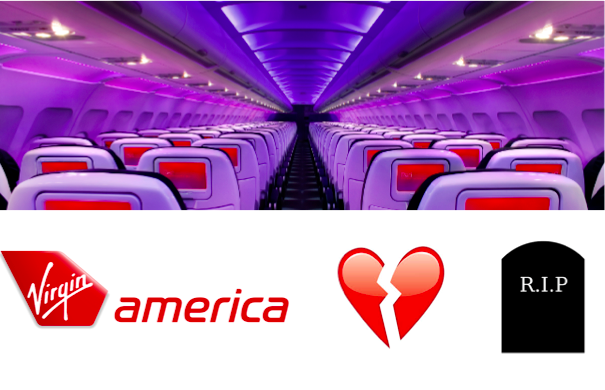 The Virgin America brand will be phased out over the next two years and disappear for good. Hopes it would survive the merger with Alaska Airlines were raised by its own marketing: Different Works was launched as the spirit uniting both brands for their shared journey ahead. Brand love is in vogue but it can be a trap. For marketers brand love suggests its customers have passion, preference, advocacy and loyalty. It may be true. But brand love can be a trap when it masks a deeper issue and encourages complacency with the status quo. Brand love measures are misleading when they don’t connect to consumption. People's standards for love have changed, too. Social media has profoundly changed people’s relationship to many things including brands. Though different from the 1960’s era of ‘free love’, declarations of brand love today have become easy for people to make when they live only in social media and do not come with commitment. These expression of love are genuine acts but when they remain inside the social media bubble their value is unreliable. How brand love is valued needs to be rethought. Love expressed in social media needs to be understood separately from ‘transactional love’ - the decision to buy that is driven by brand love over other elements (price, convenience, etc). And of course marketers should be exploring the relationship and dynamics between the two. True brand leadership means taking on business responsibility. While working to inspire a strong bond with its customers, brand strategists need to take into account the operational realities of the business they are supporting. Though flying Virgin America was awesome something was clearly misaligned if the cost to deliver the experience couldn’t be supported by the price the market would bear. While classic brand stewardship focuses on defining the core idea, shared values, character/tone and collective expression through experience, stewardship needs to have business accountability by being connected to value. One way to assess brand value is from the premium that customers are prepared to pay over alternatives. The bigger the margin, the greater the love. Price threshold research can be useful here. Understanding the levels of switching that different price points trigger can give a financially grounded sense of how much people really love a brand. Though sad, the demise of this widely admired and once pioneering brand is a timely reminder. Just because a brand is loved doesn’t mean it is enough: it has to translate into an active commitment and be scaled sufficiently to support the margin needed to remain financially viable. Without it, a brand will disappear from view however much it might be loved. Richard Branson’s euology.